Since the beginning, there was always confusion as to where to put diesels, electrics, units, and coaching stock, owing to the ever-increasing number of the newer types. 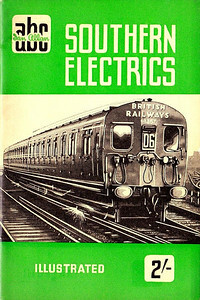 Originally, Southern electric units, then later with LMS, were alloted their own editions, even though units were included in the earlier Locomotive books. From 1948 to 1959, diesels and electric locos and units were included in the Southern Region Locomotive books, and will be found in Section 005 instead of here. After 1959, titles fluctuated wildly all the time, making it difficult to categorize types into sensible groups, so I've included them all here. Coaching Stock editions have been included here, owing to a couple of editions having DMU/EMU numbers listed. Basically, these are all those books chucked together in one group, the only constant being that I've put them in a (more or less) chronological order. 1943 Southern Electrics 1st edition, published October 1943, 24pp, 1/-, no code. Cover photo of a Brighton Pullman unit. 1944 Southern Electrics 2nd edition, published December 1943 (effectively a reprint of 1st edition), 24pp, 1/-, no code. 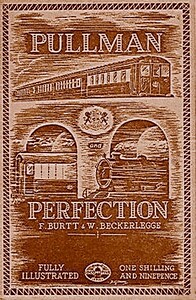 Cover photo of a Brighton Pullman unit, cover identical to the 1st edition. Reissued in 1982 (see Section 012). 1944 Southern Electrics 3rd edition, published April 1944, 24pp, 1/-, no code. Cover drawing by Baldwin of 2-NOL unit 1876. 1945 Southern (4th edition) & LMS (1st edition) Electrics, compiled by Ian Allan & Barrington Tatford, with purple cover, published June 1945, 33pp 1/6, no code. Cover drawing by Baldwin features SR 5-BEL unit 3051 & a Merseyside unit. 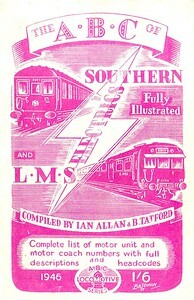 1945 Southern (4th edition) & LMS (1st edition) Electrics, compiled by Ian Allan & Barrington Tatford, with lilac cover, published June 1945, 33pp 1/6, no code. Cover drawing by Baldwin of SR 5-BEL unit 3051 & a Merseyside unit. It may be that the lilac colour is merely a faded copy of the purple edition in the preceding photograph. This edition was reissued with the original cover in 1999 (see Section 012). 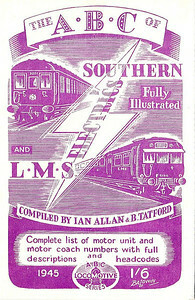 1945 Southern (4th edition) & LMS (1st edition) Electrics, compiled by Ian Allan & Barrington Tatford, with violet cover, published June 1945, 33pp 1/6, no code. Cover drawing by Baldwin of SR 5-BEL unit 3051 & a Merseyside unit. This edition was reissued with the original cover in 1999 (see Section 012). 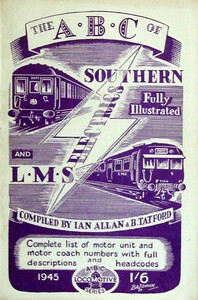 1946 Southern (5th edition) & LMS (2nd edition) Electrics, compiled by Ian Allan & Barrington Tatford, published January 1946, 33pp 1/6, no code. Cover drawing by Baldwin, same as the previous edition, depicting SR 5-BEL unit 3051 & a Merseyside unit; this edition was also possibly printed with a lilac cover, but no image has yet come to hand; once again, the difference in colour may just be a result of fading. 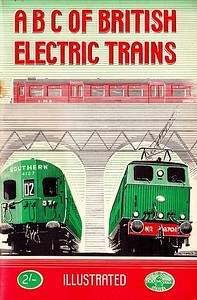 1946 Southern Locomotives (9th edition) & Electrics (6th edition), published April 1946, 65pp 2/-, no code. As can be seen, editions are becoming muddled by now; the 7th (2nd) second was presumably the 8th edition, but this isn't made clear. Also SR electrics now included. Cover drawing by Baldwin of SR 4-SUB unit 4122 and a 'Merchant Navy' class Pacific. 1946 Pullman and Perfection, 1st edition, published April 1948, 36pp 1/9, no code. Cover is brown; this is extremely rare, as only a few copies were produced, the revised 2nd edition replacing it in September 1948 - the above image is a re-coloured 2nd edition, hopefully being a reasonable facsimile, as I've never actually seen a 1st edition! 7.25 in x 4.75 in. 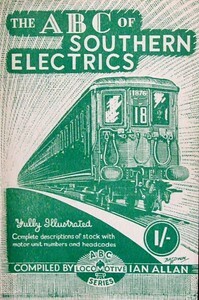 1947 British Electric Trains, by H W A Linecar, 1st edition, published 1947, 133pp 5/-, no code. Size 8.5" x 4.5". Softback, with dust cover on plain white card cover, glued at the spine. Not actually an ABC as such, nevertheless it fulfilled the same function, was published by Ian Allan, and shouldn't be overlooked. 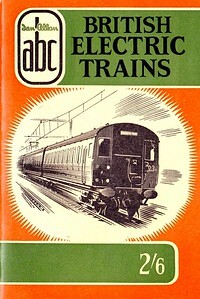 1948 ABC of British Electric Trains, published January 1948, 68pp 2/-, no code. 4127 & 6701 are pictured on the cover. This was reprinted with original cover (although glossy) in 1999 (see Section 012). 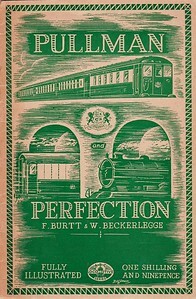 1948 Pullman and Perfection, 2nd edition, published September 1948, 40pp 1/9, no code. 7.25 in x 4.75 in. 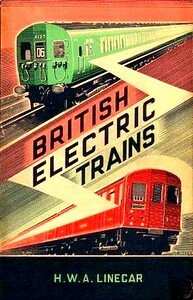 1949 British Electric Trains, by H W A Linecar, 2nd edition, published 1949, 132pp, unpriced (but probably 5/-), no code. Size 8.5" x 4.5". Softback, no dust cover. Not actually an ABC as such, nevertheless it fulfilled the same function, was published by Ian Allan, and shouldn't be overlooked. 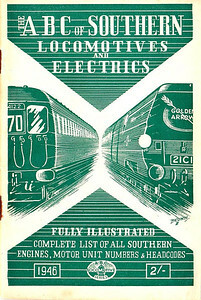 1950 Southern Electrics, published September 1950, 40pp 2/-, code: 110/361/100/950. Cover sketch of 4-SUB 4357. 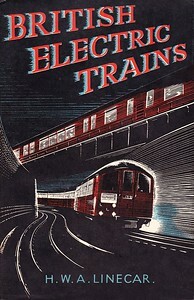 1957 British Electric Trains, published June 1957, 65pp 2/-, code: 593/418/100/657; reprinted August 1957, code: 715/461/60/857; 2nd reprint in March 1958, code: 776/253/50/358. 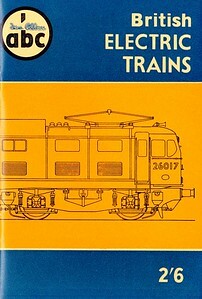 Drawing of a Class 307 EMU on cover. Reissued with original cover in 2004 (see Section 012). Winter 1957 British Railways Diesels, 1st edition, published October 1957, 64pp 2/6, code: 703/451/150/1057. Reprinted as 2nd edition in November 1957, code: 743/482/75/1157 (see following two photos). Includes diesel multiple-units. 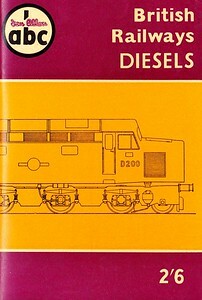 The cover drawing depicts 10201 and a DMU. 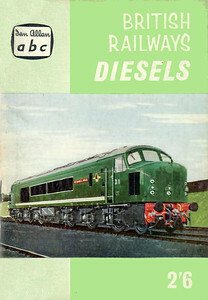 Winter 1957 British Railways Diesels, 1st edition, published October 1957, 64pp 2/6, code: 703/451/150/1057 (rear cover). 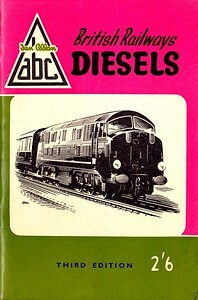 Winter 1957 British Railways Diesels, reprinted as 2nd edition, November 1957, code: 743/482/75/1157 (rear cover). Summer 1958 British Railways Diesels, 3rd edition, published March 1958, 64pp 2/6, code: 765/495/250/358; includes diesel multiple-units. This edition was reprinted the same month, as the first run had 'third edition' on the front, and 'second edition' inside, which was rectified in the second print run (see following two photos). No seperate code was issued. 'Warship' D600 is the subject of the cover drawing. 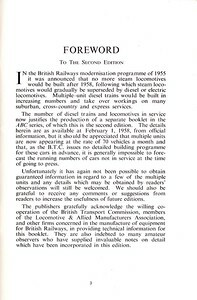 Summer 1958 British Railways Diesels, 3rd edition, published March 1958, 64pp 2/6, code: 765/495/250/358: foreword of first print run, with text erroneously referring to the book as 'second edition'. 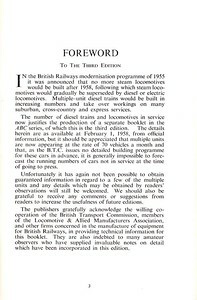 Summer 1958 British Railways Diesels, 3rd edition, published March 1958, 64pp 2/6, code: 765/495/250/358: foreword of second print run, with text now correctly referring to the book as 'third edition'. Winter 1958 British Railways Diesels, published October 1958, 64pp 2/6, code: 850/282/50/1058. Includes DMUs. The uncredited line drawing on the cover depicts D200. 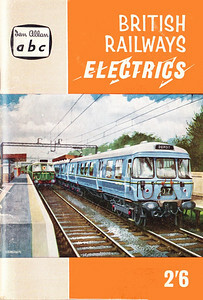 Winter 1958 British Electric Trains, published October 1964, 64pp 2/6, code: 851/283/25/1058. Line drawing (uncredited) of 26017 on cover. Winter 1958 British Railways Coaches, 1st edition, published September 1958, 65pp 2/6, code: 785/261/100/958. A second impression appeared, also in September 1958, using the same code; and a third impression (presumably constituting the 2nd edition) appeared in April 1959, 65pp 2/6, code: 924/549/50/459. All these have the same cover with an uncredited line drawing of M3724 (see following series of photos). 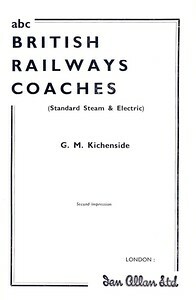 All these merely contained indications of the number series of each batch of coaches, with line drawings & photos, but no lists of numbers as such. Reissued with original cover in 1999 (see Section 012). 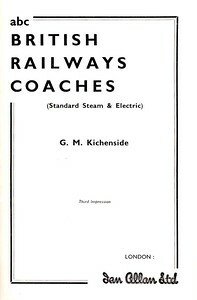 Winter 1958 British Railways Coaches, 1st edition, published September 1958, 65pp 2/6, code: 785/261/100/958, frontispiece (see also following photos). 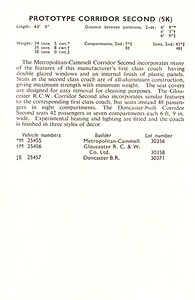 Winter 1958 British Railways Coaches, 1st edition, published September 1958, 65pp 2/6, inside of back cover; compare this with the text on the 2nd and 3rd impressions (see following photos). 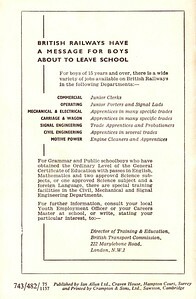 Winter 1958 British Railways Coaches, 1st edition, published September 1958, 65pp 2/6; back cover, showing code 785/261/100/958. 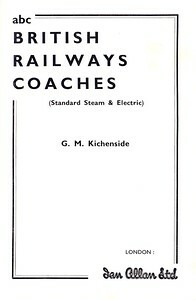 Winter 1958 British Railways Coaches, 1st edition, second impression, published September 1958, 65pp 2/6; frontispiece (also see following photos). Winter 1958 British Railways Coaches, 1st edition, second impression, published September 1958, and third impression, published April 1959, 65pp 2/6; inside of back cover; compare with that of the first impression (see earlier photo). Winter 1958 British Railways Coaches, 1st edition, third impression, published April 1959, 65pp 2/6, code: 924/549/50/459, frontispiece. Winter 1958 British Railways Coaches, 1st edition, third impression, published April 1959, 65pp 2/6; back cover, showing code 924/549/50/459. Summer 1959 British Railways Diesels, published July 1959, 64pp 2/6, code: 929/557/500/759. 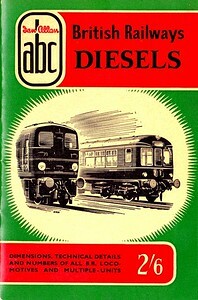 As the cover might indicate, includes diesel multiple-units, one of which is shown in the photograph on the cover. 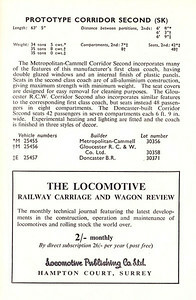 Winter 1959 British Railways Diesels, published November 1959, 67pp 2/6, code: 963/574/1159. Includes diesel multiple-units. The cover is from a Vic Welch painting of 'Peak' D1 "Scafell Pike". 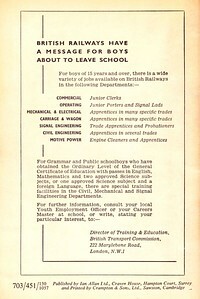 Winter 1959 British Railways Electrics, published November 1959, 72pp 2/6, code: 962/573/2259. Cover painting of blue Clydeside (class 303) unit. Summer 1960 British Railways Locomotives, Part 5 - Diesels, published May 1960, 72pp 2/6, code: 1021/5/618/500/560. Includes diesel multiple-units. Photo of D226 on the cover. Winter 1960 British Railways Locomotives, Part 5 - Diesel Locomotives & Multiple-Units, published November 1960, 72pp 2/6, code: 1047/5/639/500/1160. D6127 & D5544 are two of the three diesel locos in the cover photogtaph. 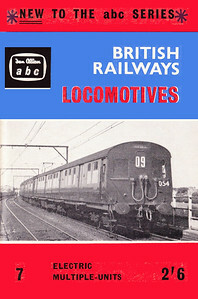 Winter 1960 British Railways Locomotives, Part 6 - Electric Locomotives & Multiple-Units, published November 1960, 72pp 2/6, code: 1047/6/639/200/1160. Photo of E3001 on cover. Summer 1961 British Railways Locomotives, Part 5 - Diesel & Electric Locomotives, published May 1961, 64pp 2/6, code: 1072/5/668/500/561. Photo of an unidentified 'Deltic' on the cover. Summer 1961 British Railways Locomotives, Part 6 - Diesel Multiple-Units, published May 1961, 64pp 2/6, code: 1072/6/668/250/561. 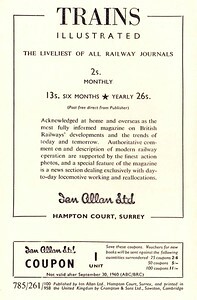 The first edition solely for DMUs, with a photo of 'The Blue Pullman' on the cover. Summer 1961 British Railways Locomotives, Part 7 - Electric Multiple-Units, published May 1961, 64pp 2/6, code: 1072/7/668/250/561. Cover photo of (class 306 EMU) 054. Winter 1961 British Railways Locomotives, Part 5 - Diesel & Electric Locomotives, published October 1961, 64pp 2/6, code: 1134/5/726/1061. E3021 is seen in the cover photo. Winter 1961 British Railways Locomotives, Part 6 - Diesel Multiple-Units, published October 1961, 64pp 2/6, code: 1134/6/726/1061. 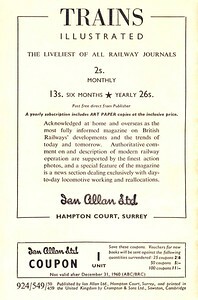 Photo of 51829 on cover. Summer 1962 British Railways Locomotives, Part 5 - Diesel & Electric Locomotives, published July 1962, 48pp 2/6, code: 1164/5/757/400/762. 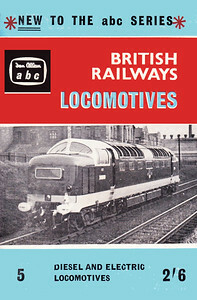 Photo of Class 45 & 40 locos on cover. 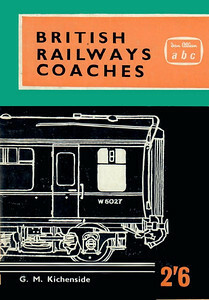 1962 British Railways Coaches, 3rd edition, published August 1962, 64pp 2/6, code: COA/1180/772/150/862. Cover has an uncredited line drawing of W5027. As with the earlier editions, no lists of numbers to be found here; it would have been very disappointing for a spotter, had there not been such a lot of locos & units to be getting on with!